There are many misconceptions about laser eye surgery from problems with age, which kind of sight problems it can treat and risk. So what are the facts about laser eye surgery? Without question, laser eye treatment is the safest in the world. Technology has minimised the risk to virtually zero and helped surgeons gain a better understanding of the eye. We put in place stringent safety checks to ensure you are suitable for treatment before we undertake any procedure. Our eye surgeons are pioneers in the field of eye surgery and are in demand all over the world. Taking all of this into account, the chances of a small impairment to vision following surgery is just 1 in a 1000. There is a myth that only short sighted people can be treated through surgery. Rest assured, both long and short sighted people are suitable for treatment. This includes people suffering with presbyopia and astigmatic conditions. Once the shape of your cornea is changed through eye surgery the effect is permanent. This means that the treatment you have today will still be helping you see better for years to come. Our eyes change naturally overtime like the rest of our bodies. Long term studies on the affect of eye surgery, however, show that once you are aged 50+ you will only see a slight change in your prescription every ten years. A common myth is that there is an age limit on those who can have eye surgery. The fact is that it is the health of your eye which is the determining factor. We put your eyes through stringent tests to determine suitability. Providing your eye is healthy for surgery, we can correct your vision regardless of your age. So, age is definitely no barrier. Though there are risks from all surgical procedures, the chances of going blind from eye surgery is virtually zero. 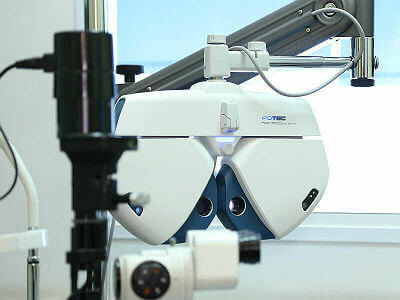 At Advanced Vision Care, we use the best technology and employ the very best surgeons in the world. This combination means that the chances of blindness and indeed a problem of any kind is virtually nil. With or without glasses, your vision will be better after surgery. It is virtually impossible for it to be worse. The chances of your vision being worse either wearing or not wearing glasses is as small as 1 in a 1000. With this in mind, it is fair to say that your vision will be better after surgery. One of the main eye conditions which result in people requiring reading glasses is presbyopia. Technology and our understanding of the eye has resulted in this condition being treatable regardless of age. So, if you have started using reading glasses, we can help you improve your eyesight so you will no longer need to use reading glasses. This is regardless of whether or not astigmatism is involved. Laser Eye surgery is the most commonly performed elective surgical procedure in the world and the most successful. It has fast recovery times, normally around 24 hours, and has minimal discomfort and pain. Since its introduction in 1987, around 35 million operations have been performed. If you are long or short sighted and want to ditch your glasses or contact lenses forever and would like to find out more about the laser eye surgery at Advanced Vision Care, then why not call AVC TODAY on 0800 652 4878 and request your free information pack or book your consultation to find out how we can help you.